Flugelhornist Clark Terry, tenor-saxophonist James Moody, altoist Bunky Green and drummer Elvin Jones all had releases out for Vanguard at the time. 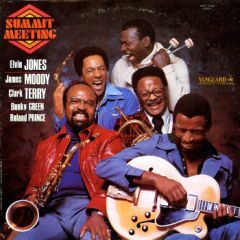 Those bandleaders are joined by guitarist Roland Prince, pianist Albert Dailey, bassist David Williams and percussionist Angel Allende and the combination works quite well. The music is essentially bop and blues with Terry often taking honors while Green sounds the most modern of the soloists.